In a nail-biting championship, it all came down to the final rotation. Lindenwood, Bridgeport and UIC were separated by less than two tenths; whoever could take the fourth and final rotation would be crowned national champions. The fight started from the moment the buzzer sounded on the first rotation. 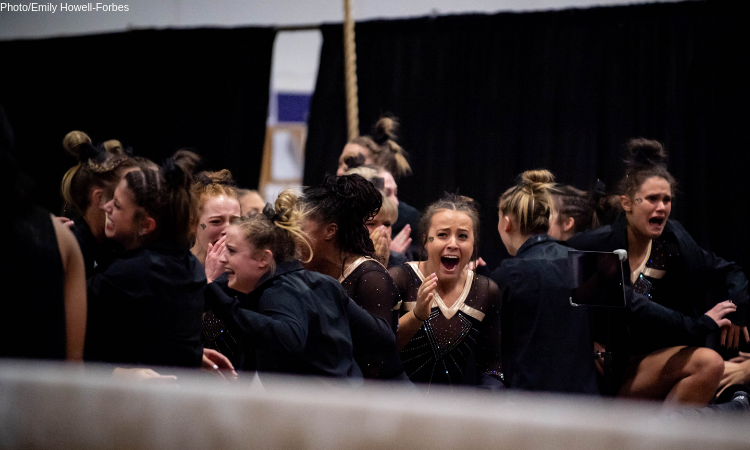 Since both semifinals had ended with less than a tenth separating the first- and second-place qualifiers, each team knew it had a real chance at winning the national title. For the first two rotations, all four teams brought their A-game. The final tally at the meet’s halfway point showed a separation of a little over two tenths; an imperceptible difference in a postseason finale. Unfortunately Air Force suffered a devastating beam performance during the third rotation, where it counted multiple falls. This knocked the Falcons out of the running. The Lions’ final 196.375 tally was enough to edge out UIC, who finished with a 196.025 in its last collegiate meet competing together as a team, as the school cut both men’s and women’s gymnastics in the fall. Bridgeport’s 195.925 earned a third place finish and Air Force finished with a 194.575. Senior Andavea Alexander agreed that the motto embodied what “Team Seven”—a nod to this being the program’s seventh year as an NCAA team—is all about. “That’s exactly what we did today, we earned,” she said. Lindenwood has also earned its fair share of results this season, despite being the youngest program in NCAA gymnastics. After a number of winning performances, the team ended its regular season ranked 36th in the nation. This program-best finish qualified the Lions for NCAA regionals—only the third DII team in history to do so. Despite a loss to George Washington in round one, the Lions came back strong in yesterday’s USAG championships team final. This will mark the program’s third national title since its formation in 2013.